Happy Holidays Round Up! Adrian Martin Interview, New Journal Issues, Videographic Film Studies and Much More! UNCANNY FUSION by Catherine Grant: VIAGGIO IN ITALIA/JOURNEY TO ITALY meets…? It's been a busy few months and a fair tuckered out Film Studies For Free is off on its annual screen-free holidays from tomorrow for just over a week. While it chills out on a sweltering beach somewhere, generous to a fault (so it says), it's leaving you with LOTS of links to fabulous open access reading, viewing and listening. Just check out the wondrousness below. On the longest day of the year, June 21, 2014, Film Studies For Free's author interviewed film studies writer and thinker extraordinaire Adrian Martin. Our conversation took place in the quietest spot we could find in the historic center of Milan late on a World Cup match night. We were both visiting that city for the conference of the Network of European Cinema and Media Studies (NECS), and had been part of a workshop panel that day on videographic film studies, or "audiovisual approaches to audiovisual subjects." We discussed Adrian's turn to audiovisual essays (many made with Cristina Álvarez López) as well as his work more generally, and talked about his new book Mise en Scène and Film Style: From Classical Hollywood to New Media Art (forthcoming from Palgrave Macmillan, later in 2014). Adrian's latest De Filmkrant column 'Serve Yourself' offers an extract from the book as a preview of it: the column is on-line here: http://www.filmkrant.nl/world_wide_angle/10805. In the interview, Adrian talks in detail about a particular audiovisual essay -- Intimate Catastrophes -- which he co-edited with Cristina Álavarez López for the Transit: Cine y otros desvíos website. Also see "[De Palma’s] Vision" by Martin and Álvarez López here: https://mubi.com/notebook/posts/de-palmas-vision. The interview is available from Film Studies For Free's Podbean Site. Two new cinephilia links from Photogénie! Also, see Photogénie's new call for your personal accounts (in words or images) of your favorite cinephiliac moments here. Michael Chanan has just uploaded his marvellous video tribute to the remarkable Brazilian documentarist Eduardo Coutinho. For further tributes to Coutinho see here. Great updates at the Ingmar Bergman Foundation website! Excellent interview with film scholar Richard Misek, creator of the feature length essay film ROHMER IN PARIS: http://contrappassomag.wordpress.com/2014/05/01/contrappasso-extra-interview-with-richard-misek-rohmer-in-paris/. See his short video essay Mapping Rohmer here: http://framescinemajournal.com/article/mapping-rohmer-a-video-essay/. David Hudson's tribute entry to Robert Gardner, 1925 – 2014, Anthropologist, filmmaker, author and advocate of the avant-garde: http://www.fandor.com/keyframe/daily-robert-gardner-1925-2014. Niamh Thornton on violence in Amat Escalante's 2013 film HELI. Great article at Sight and Sound, on "The cinema of the Palestinian revolution"
Transit's new video essay dedicated to deers in cinema! dossier of the film is here; pt 2 here. Film Studies For Free had such a great time at the conference of the Network for European Cinema and Media Studies conference in Milan last week that it is a little delayed in bringing its readers news of the publication of the latest issue of this organisation's wonderful Open Access journal NECSUS. The great table of contents is given below. More will be forthcoming from FSFF about the Milan conference in a few days (including the recording of a wonderful interview gathered there...). But one of the hottest news items from the conference is that video essayists Adrian Martin and Cristina Álvarez López will develop and edit a new video essay section for NECSUS, to debut in the Autumn 2014 issue. More details about this very welcome development are given here. Film Studies For Free brings you tidings of some more wonderful film studies related videos. Both of them, like yesterday's Rancière videos, came from top notch tip offs by Hoi Lun Law (thanks HL!). In the above video (online here), Andrew Klevan enters into an incredibly thought-provoking and insightful conversation with the great American filmmaker Kelly Reichardt about her work. Reichardt's five feature films are River of Grass (1994), Old Joy (2006), Wendy and Lucy (2008), Meek’s Cutoff (2010) and Night Moves (2013); and she has also made the short narrative Ode (1999). Klevan is Lecturer in Film Studies at the University of Oxford, and author of, inter alia, a recent book on Hollywood film star Barbara Stanwyck (London: BFI/Palgrave, 2013), which he discussed in a number of formats with Film Studies For Free. He is also a member of the editorial board of Movie: A Journal of Film Criticism. Below, you can find the embedded recording of a great talk by Klevan's fellow Movie editorial board member James MacDowell, Assistant Professor at the University of Warwick and a film scholar who has shared far more high quality work online for free than many academics produce in a lifetime (see here, here, here, here and here [PDF], for instance). MacDowell discusses the romantic ‘happy ending’ in Hollywood cinema - its motifs, meanings and potential mutability - in a brilliantly illustrated and entertaining talk for an event for the Zabludowicz Collection which took place on December 6, 2013. MacDowell is the founder of great film critical website Alternate Takes, author of the book Happy Endings in Hollywood Cinema: Cliché, Convention and the Final Couple (Edinburgh University Press, 2013) and he is currently writing a monograph on irony in film for Palgrave MacMillan (forthcoming 2016). Embracing the Happy Ending: Cliché and Closure in Hollywood Cinema - a talk by Dr. James MacDowell from Zabludowicz Collection on Vimeo. The above videos provide the sole focus for a fairly self-explanatory -- and wonderful -- entry at Film Studies For Free today: they present the recording of a lecture and discussion on cinema by the hugely eminent French philosopher Professor Jacques Rancière at the Centre for Film Aesthetics and Cultures, University of Reading, UK. Thanks to Professor Lúcia Nagib and the other faculty at CFAC for making this event happen and, especially, for making the recording accesible online for everyone to watch it. Rancière's lecture begins about fifteen minutes into the first video. Thanks to Hoi Lun Law for the tip-off that these recordings had gone online. FSFF can't wait to watch them! Synoptique cover by Malory Beazley based on an image by flickr user lecercle. It's about time for some link action at Film Studies For Free. Indeed, there will be a little flurry of long overdue entries here over the next days too as there are lots of new issues of great online journals to flag up, as well as other important resources to publicise. 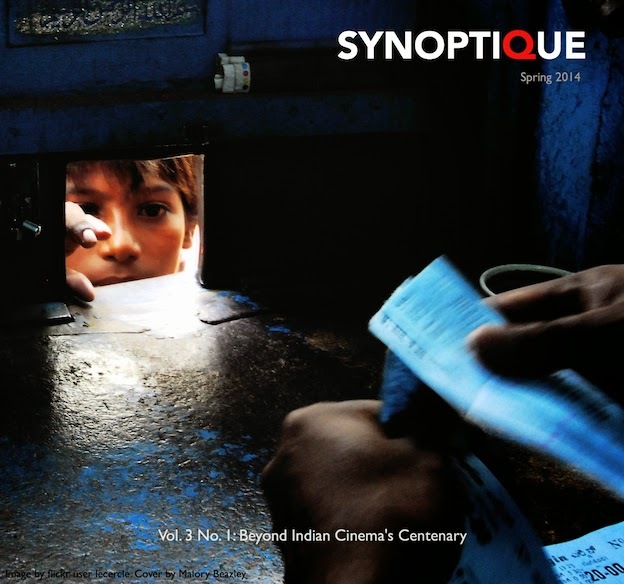 First up, today, news from SYNOPTIQUE about the launch of its latest issue devoted to the Centenary of Indian Cinema, guest edited by Catherine Bernier. The table of contents is given below, or follow the link to access the journal.